We are still 10 days away from finding out if we are having a boy or a girl but I thought I would share with you the base idea for the nursery. 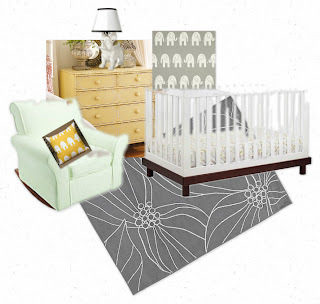 Most of this stuff we already have like the grey Ikea rug and the rocker (that I picked up for $12 at a garage sale this summer!). The dresser in the picture isn't our exact dresser but I am planning on repainting my childhood dresser in a similar yellow color. We've also recently picked up an awesome dog lamp from Target and I bought the grey elephant fabric to make into curtains. We haven't gotten a crib yet, but I'm loving the Babyletto Madison Convertible crib. The grey and yellow theme is our base theme and then we will accessorize with other colors depending on whether we are having a boy or girl. I'm excited to start working on the nursery but there is a lot of cleaning/room deciding to do before that. The color conbination the nursery is beautiful .